The Japanese capital has a surprise visitor - a grey whale spouting water in Tokyo Bay. The whale, about 10m (33ft) long, was spotted close to Sodegaura, an industrial city in Tokyo Bay. Kazutoshi Arai, deputy curator of nearby Kamogawa Sea World aquarium, said it was first seen by fishermen two weeks ago. Holidaymakers have been delighted by the visitor. Japan is currently celebrating its annual "Golden Week". 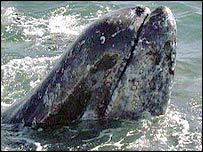 Mr Arai said about 30,000 grey whales live in the Pacific Ocean. They feed on marine worms and crustaceans, and can weigh up to 35 tonnes. Whales are best known in Japan as a culinary delicacy. Each year Japan kills about 400 minke whales, as well as a smaller number of Bryde's whales, sei whales and sperm whales, in the name of research. Critics say that Japan is using the excuse of scientific research into whales as a pretext to continue selling, and eating, whale meat.